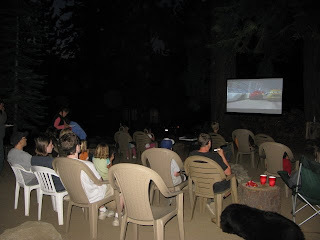 Last night we had our second Annual Outdoor Movie Night. Last year one of our campers brought a projecter and big screen, and we showed Ratatouille outdoors. The kids loved it. The adults loved it. This year he brought an even bigger screen. 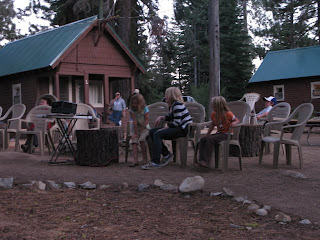 The kids started showing up early, getting a front row seat and waiting for it to get dark. Mark popped buckets of kettlecorn on the outdoor grill while we all waited. We watched Cars, a very family-friendly movie with enough humor to keep the adults happy too. We put the movie on pause at about 9:53 so we could watch the space shuttle go by. We could see it for about two minutes, easily visible among all the stars. It was very surreal for me. Here we were in our home-away-from-home, surrounded by wide-open spaces and all the glories of nature, watching thirteen people in their home-away-from-home, cramped in a space shuttle but also surrounded by wide-open spaces and the magnitude of the universe. And the sewing update: lots of time to actually sit down and sew, but then my table got relegated to be part of the "projection room,"
So maybe later today? Or maybe not....I think maybe I'll just wander down to the lake and think about it. 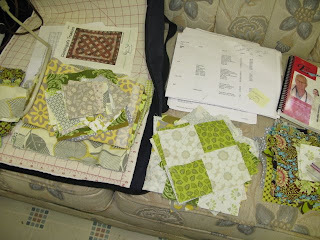 Okay, I'd better hush and get back to my own sewing machine. Enjoy the lake while you can! I'm really liking those fabrics. Can't wait to see what you do with them!